Chugalug - [Chugalug] Anyone having speed issues with EPB? 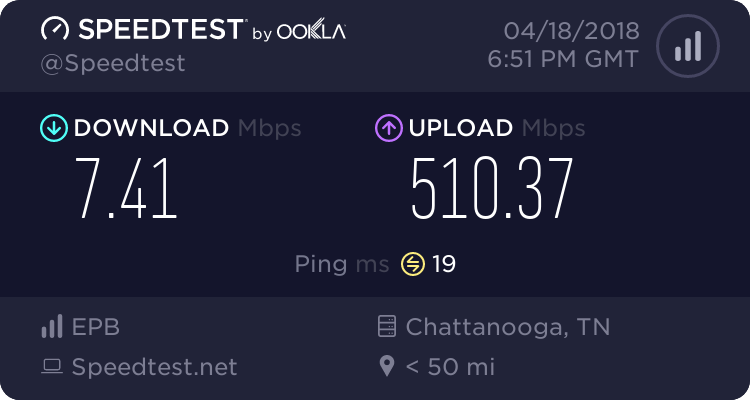 [Chugalug] Anyone having speed issues with EPB? And those tests are pretty consistent :-( less than 10 Mbps down, but roughly 500 Mbps up. I get those results regardless of which server I try on speedtest.net, and same results from other speed test sites. Re: [Chugalug] Anyone having speed issues with EPB? Hey, can you contact me off list? So something very very weird... It looks like they are throttling now??? Or possibly routing issues? When I generate a new MAC address for my macbook directly to the ONT, I get a different IP address of course, because my macbooks MAC is different. I get full speeds. (I know changing MACs is horrible in practice, but its great for troubleshooting). If I change my Macbooks MAC address to match what my pfSense box was (so I get my old DHCP reservation back) and wire directly in to the ONT I get the slow speeds. So, my old MAC address (and its associated sticky reservation) is definately horribly slow, while a new MAC addresses (and new DHCP stick reservation) is full speed. Very curious about the outcome of your findings. Any updates? John worked with me yesterday within minutes of my initial email to the list, and found a issue that affected a few other customers. They had it fixed pretty quickly, but I wasn't at home to test when he unicasted me last night. By the time I got back home from visiting my parents, it was nearly 1 AM. BUT....my speeds and ping times were back to normal when I tested it around 1:30 AM. So far, things are still back to normal (ran a test about 9:30 am). I'll keep monitoring it throughout the day. Dean, if you do have any curiosities you can message me off list. I’ll be happy to try to answer any questions.